Sorry, another alphabet cop out. (The only way is up from here!) However, it is a relevant one with holiday season upon us. If you aren’t a travel sickness sufferer (or the designated driver!) then long car journeys are a perfect opportunity for some crochet time. I find crochet relaxing (generally!) so I always have a project that is portable which I can take in the car and on holiday. Those warm summer evenings in the caravan awning (or even outside), a beverage of choice (I quite like a nice pear cider or a hot chocolate) and some good company go hand in hand with a lovely little crochet project. I keep my projects in fabric bags so that all of the bits for them are kept together, but some are more suitable for taking out of the house than others. I also take.my crochet hook roll everywhere so I don’t lose my hooks, scissors or needles. Anything bigger than a baby blanket isn’t great for working on in the car! I like things that are made of multiple pieces, like granny square blankets, as portable projects because you don’t need to take the rest of the project with you and you only need a few balls of wool. I also think carefully about patterns for on the go projects. Nowadays most of my patterns come from the Internet and I just bookmark them on my phone. However, caravan sites (from experience) tend to not have the best reception for mobile Internet. I either screenshot the pattern and save it as a photo or steer clear of projects which are too complicated. Simple repeating patterns are ideal as, if you’re anything like me, keeping track of where you’re up to when you’re constantly interrupted (for example to navigate stupidly complicated roundabouts-I love my husband dearly but he can read road signs as well as I can) is really tricky and leads to frustrating mistakes. 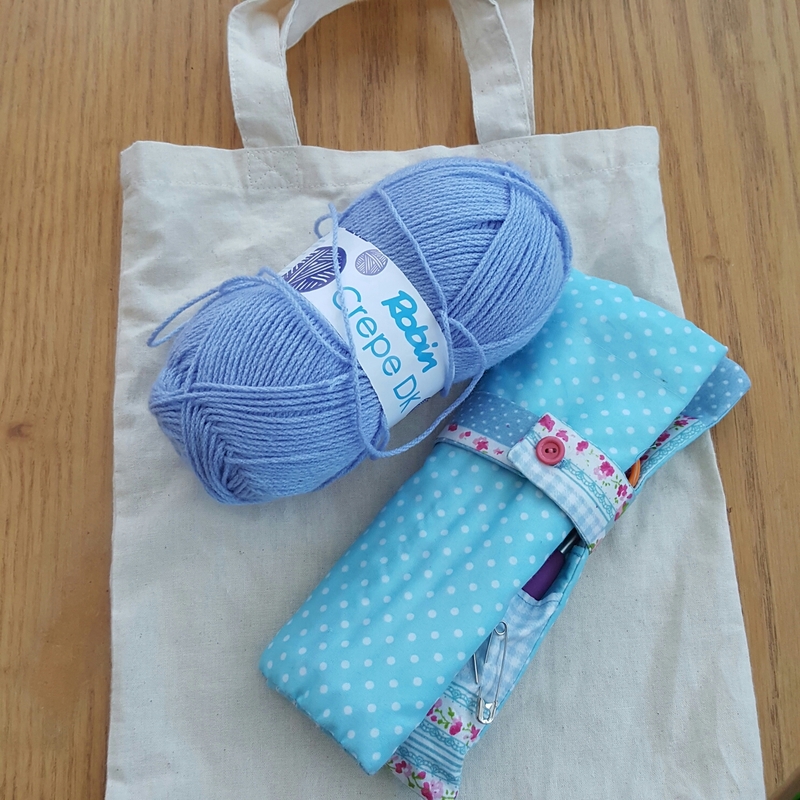 Do you crochet on the go? What are your top tips for it? That’s not good! My daughter gets sick in the car, I must remember to wind her window down. You would laugh, and my adult children still do. When they were small we took them to a theme park for rides.. I went on a very small ride with them they were only around the ages of 7 and 9.. It was an octopus ride that spun around.. I always have a bag at the ready. Its been perfect for making my mini stockings or little baby hats. All my patterns are bookmarked on my phone but I haven’t thought of bad reception areas so I’ll be using screenshots from now on. Thanks for that tip. I currently have 3 bags of crochet projects! I really ought to finish one soon. A project for on the go is so organized! I am the same. I try to at least keep a ball of scarf yarn and short needles in a bag so that I can grab and go. I can knit one up in about 4 hours. No thinking, no pattern needed. And it distracts me from crazy drivers 😉 I am a little panicky in the car. That’s a good idea, I prefer not to look at crazy drivers either! I get car sick, but I find that I can knit and crochet on trips, as long as I’m not following a pattern. If I have to read- that’s not going to end well. But normal knitting and crocheting? Absolutely! How funny! I stick to patterns I know as I hate juggling my phone, yarn and hook. I like to crochet on the go. Mostly on the tube and long train journeys. Also in waiting rooms, and on my lunch break at work. It really is surprising how much you can get done in a small period of time!